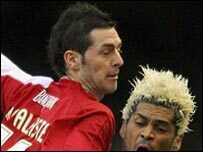 Bristol City's Jamie McAllister has been named as the FA Cup "Player of the Round" for the fourth round. The defender impressed in midfield in City's 2-2 draw with Middlesbrough, and polled over 35% of supporters' votes. McAllister, 28, is the second City player to win the award this season, following Phil Jevons in round two. The four other players nominated were Blackburn's Matt Derbyshire, Reading's Leroy Lita, Preston's David Nugent and Plymouth's Scott Sinclair. McAllister now joins seven previous winners in the "Team of the FA Cup". He will also receive a VIP invitation to the 2007 FA Cup final. In addition, the winner in each round will be given an engraved silver salver, and £500 worth of football equipment for a local school of his choice. The "Team of the FA Cup" so far comprises Matt Lewis (Halesowen Town), Gary McPhee (Nuneaton Borough), Byron Bubb (AFC Wimbledon), Paul Booth (Lewes), Kris Commons (Nottingham Forest), Phil Jevons (Bristol City), Jason Puncheon (Barnet) and McAllister. Fans can vote for the player of their choice on the Football Association's official website.